To begin, I will let you browse over the Top 16 Decklists of the event. What is the main observation you are making? Is it this ? Yeah, our man Edwin has been a busy boy hasn’t he? He’s a 4-of in almost every deck. Kind of why he’s a 200$ + card. 4 What’s Haunting Witch Hill? 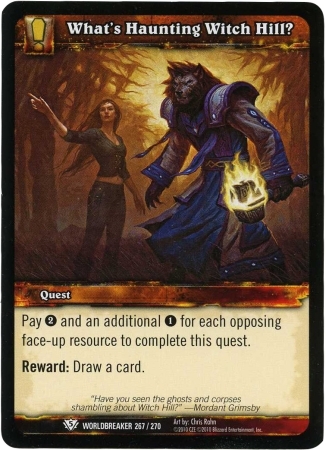 We also noticed another major thing: How the heck does this deck ever win? For starters, we have Dragonwrath, Tarecgosa’s Rest . Looks slow and clunky and rather unimpressive. Well, it does give us a 5/5 when i enters play. That’s somewhat cool in that if it gets destroyed you still get a dragon. However, if this stays in play, it should be an easy game to win. You are just hitting ability after ability, spamming dragons or just playing conservatively with just a couple of dragons and enough cards in hand to back them up. Barring some kind of board whipe AND equipment destruction, you should be winning that match. Mr. Wafo-Tapa is renowned for running such decks in the Magic: the Gathering world and it is not surprising to see him play this in WOW. What is surprising though, is that it performs extremely well. 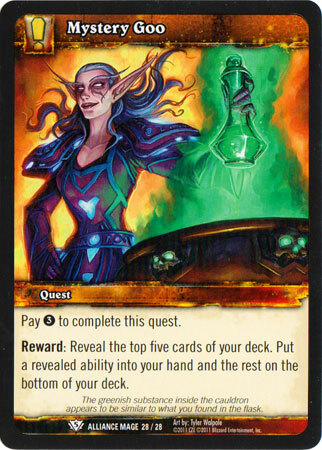 It also implies that the deck requires more skill than your run of the mill WOW deck does in order to get some wins. I guess you would need to see the flip side eh? Now that’s more like it! Now you’re playing with power (TM) ! mmm….are you really though? how often are you going to be “storming” into 3 frost/ICE symbol spells? While you can realistically do it, chances are you will not. See, usually doing something like playing 3 spells a turn in wow to get a hero flip would imply it’s an ‘Epic’ flip, which this isn’t. So we are stuck grinding the long game, Wafo-Tapa style. I know for the majority of WOW players, the long game is something past turn 6 or so. So let me rephrase that: the ‘really long’ game! On the small plus side, her flip can probably also count as a win condition if your opponent does not pack any maindeck equipment with an Armor Value of 1 or more. I had to restrain myself from laughing. Don’t get me wrong, this is one solid piece of cardboard. It would be sooo hot if it wasn’t actually a frost-looking water elemental. All kidding aside, this guy is awesome. He will tap down their big guys and no get attacked into. If he really needs to he can even attack into a really annowying 1/1 (I just can’t think of a relevant one). 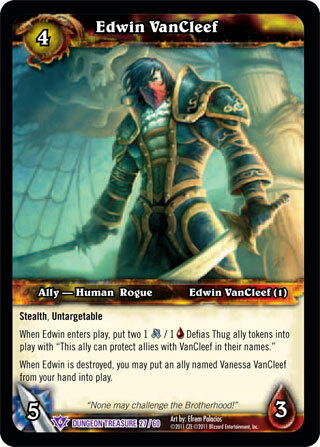 He’s a frost card too, so he can also be one of the 3 cards you play to ‘free’ flip Sira’Kess and start pinging away. In all it’s large glory, so that you may read the text. So, tap their guys, AOE/board whipe their guys and pacify their guys. This will do the rest. You now begin to understand the reasoning for the Mosnter Hero. She will be able to ping down opposing Ice Barriers in order to not die to them. The Abyssal Maws can also provided extra life in the mirror match in order to outlast your opponent. Good Stuff! 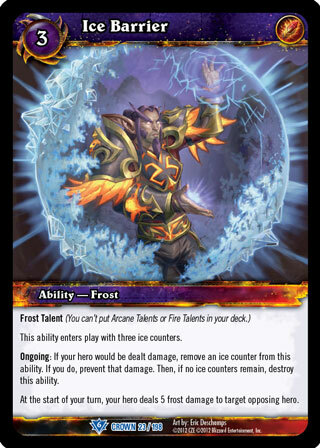 When I first saw this card, I knew I wanted to play it in my old Frost Mage control build. It’s pretty neat in the sense that it obviously ‘fogs’ their dudes but in many events, can even kill some. This is great value. 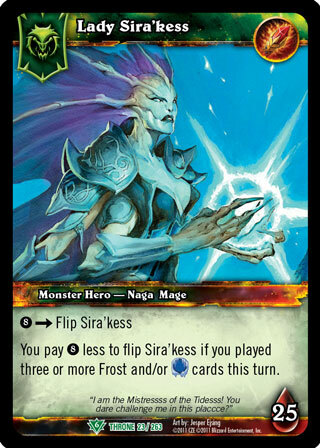 Also, as a frost card it can allow you to storm flip Sira’Kess and also trigger an Abyssal Maw sometimes. However that second one can be tricky, since you woudl need to use this otherwise defensive card offensively and on your turn, ouch! Gets rid of creatures, like for good. 3 is the magic number for early drops and we don’t absolutely need the versatility of Fire blast to shoot players really. I put these together because you need to sometimes counterspell thing that are one shot-ish or really do something nut. 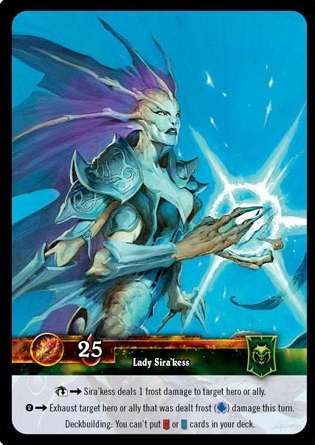 However if it’s an ability or abilities that you can just steal with Manashift (Grand Crusader, Ice Barrier), why bother? is it a weapon or annoying ability? Mask it! The card draw and boy is it ever good! 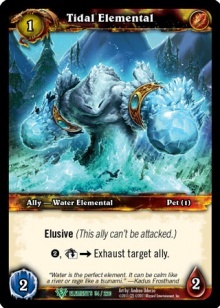 Agate is a 4-of vs Bottle because on turn 4 you can safely cast it and then have a Overload backup for their turn or crack it to draw 2 if they do nothing. Boundless Magic is surprisingly insane. Comparable to a Brainstorm in Magic, but much much better late game because it goes back into your deck and allows you to go through more cards per usage. I also just noticed it’s NOT an isntant. Boo! I guess that makes it more of a Ponder. Bottled Knowledge is still a necessity as it digs 4 cards for 3 mana which is huuuge. Versus less aggro decks you can drop it without having 2 up for an Overload, however that’s more the exception than the rule. Made nicer with the reprint, it is sometimes a necessity against things that generate wayyyy to many guys and swarm kill you. I know 6 ressources is a lot in this game, but it kills a small horde and slows down their subsequent attacks. Some card draw,selection. Also Signed in Blood, which seems more like a European meta-call that I would not mind trying locally. All in all, I think everyone should at least try this deck once. It allows you to at least see how hard it is to play a proper control deck in this format. It rewards great technical play and punishes sloppiness. The greatest part, in case you hadn’t noticed is that it costs a LOT less than all the other decks. In fact, even without the other decks having Edwins, they still have things like Mazu’Kon which costs a fortune compared to everything in this deck. 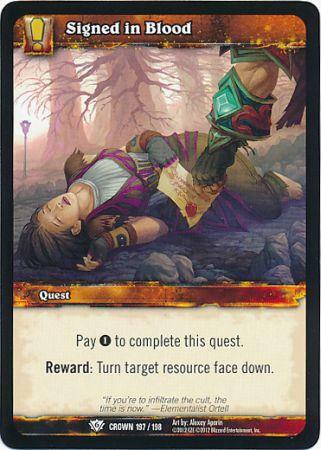 This entry was posted in World of Warcraft TCG. Bookmark the permalink. 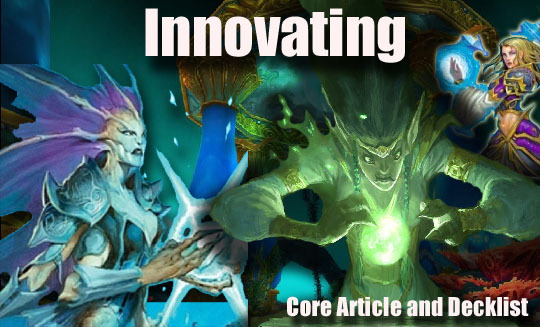 Steve, Nice article… need more updated wow content should generate some traffic / business.